I am sure you are all well into your Christmas shopping, but I bet you are stumped for a few presents? Neighbours, Teachers, Friends, extra gifts for sisters and mum's? And not forgetting the men in our lives! So I bring you some fabulous sets and gifts from Baylis and Harding. I don't know anyone that does not love the little bit of luxury you get with a Baylis and Harding product and their Christmas gifts are amazing. Certainly something for everyone. Baylis and Harding Fuzzy duck range - inspired by their very own boutique Cotswold country Inn. In 2013, the family behind Baylis & Harding saved their local pub from closure by refurbishing it and creating a place where the traditional family values of this great British brand and its luxury heritage can be wonderfully experienced. The Fuzzy Duck is a boutique inn, set in the heart of the Cotswolds – it offers the perfect luxurious country retreat. 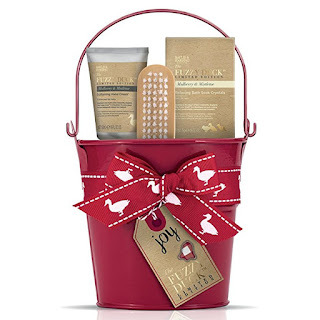 The Fuzzy Duck Festive Collection, captures the essence of that pampering experience at Christmas with a fantastic range comprising luxury toiletries and home fragrance products. Packaging is quintessentially Christmas in warm red, pine green and silver with rustic luggage label gift tags, green strip ticking and red gingham prints. In a Mulberry and Mistletoe fragrance this gorgeous range beautifully captures the nostalgia of the season. 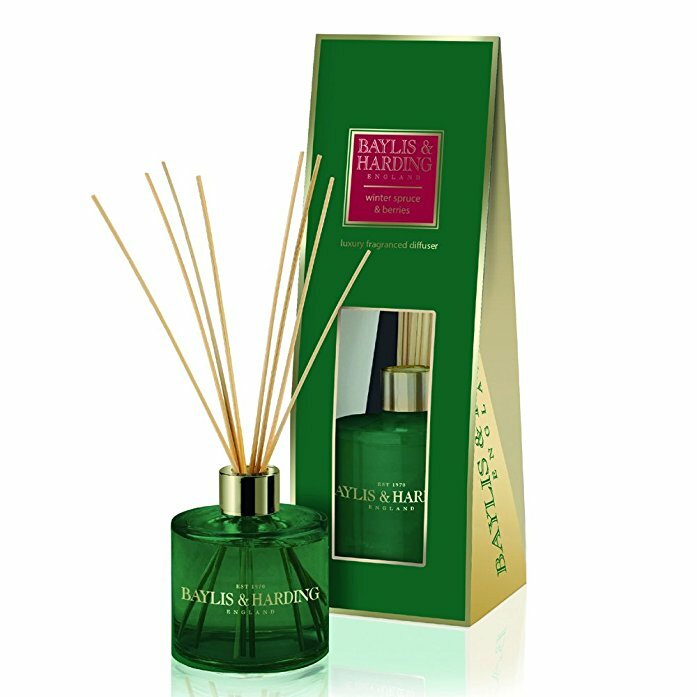 For a truly festive feel the fragrance experts at Baylis & Harding have combined classically warm Mulberry with green and wintry Mistletoe. The result is a sensational scent which perfectly captures the nostalgia of the season and brings to mind warm cosy nights in, wrapped in blankets and sitting by a log fire. Baylis & Harding’s Fuzzy Duck Festive Mulberry & Mistletoe Luxury Slipper Set is the perfect treat for hard-working friends and family. This beautifully presented gift set contains a selection of luxury bathing treats and stylish mule slippers. The 100 g Bath Soak Crystals ease away aches and pains, the 100 g Soap and 50 ml Shower Gel gently cleanse the skin and the 50 ml Body Balm keeps tired legs and feet supple and feeling smooth. The final step is to slip on the super soft mule slippers and feel all the cares of the day slip away. All products are fragranced with Mulberry and Mistletoe, a warm and wintry festive scent which perfectly captures the essence of a Cotswold Christmas. Baylis & Harding’s Fuzzy Duck Festive Mulberry and Mistletoe Tin of Treats makes a delightful stocking filler or secret Santa gift this Christmas. The gorgeous festive red gift bucket with rustic luggage tab and duck motif ribbon, contains three gorgeous bathing luxuries. The 75g Bath Soak Crystals eases away aches and pains, the Wooden Nail Brush keeps hands in tip top condition, and finally the 50ml Hand Cream hydrates and softens hard working hands. Baylis & Harding’s Fuzzy Duck Festive Mulberry & Mistletoe Hand Wash & Hand Lotion Set makes a perfect treat for yourself or loved one this Christmas. The fabulous two-bottle wire rack with festive red ribbon contains a duo of luxurious hand care products. The 300 ml Hand Wash leaves skin feeling gently cleansed and deliciously fragranced, whilst the indulgent 300 ml Hand and Body Lotion both nourishes and moisturises to leave skin silky smooth. Winter spruce and berries range - Everyday can feel like Christmas with this wonderful Limited Edition fragrance of Winter Spruce and Berries. Sumptuous red berries have been carefully blended with evergreen Spruce and Pine to create a unique home fragrance which evokes festive memories. Baylis & Harding's Seasonal Home Fragrance Collection is a festive Limited Edition range. Winter Spruce and Berries is beautifully packaged in forest green and ruby red with accents of gold. Baylis & Harding’s Large Luxury Diffuser Set makes the perfect gift or treat for yourself. The set, comprising diffuser and reeds, will infuse its stunning fragrance around you home for up to 10 weeks creating a lovely ambience. Expertly fragranced with Baylis & Harding’s wonderful, new festive Winter Spruce and Berries. This fabulous festive candle makes a Christmas Gift that will appeal to all ages. 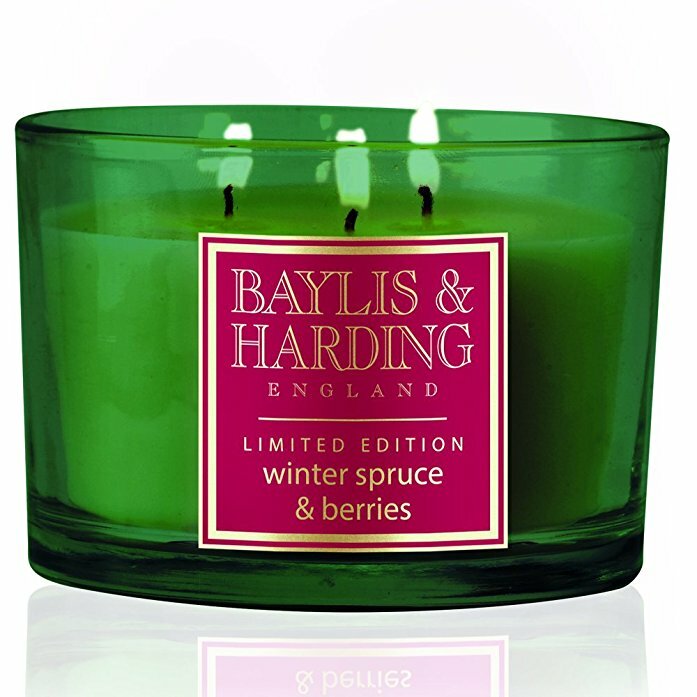 The luxury fragranced triple wick has an impressive 30 hours burning time and comes in Baylis & Harding's new limited edition festive fragrance of Winter Spruce and Berries. The gorgeous candle is presented in a stunning festive metallic glass jar. Baylis & Harding’s Beauticology Carnival Collection is a real show-stopper. The curtain goes up on a range of deliciously fun bathing luxuries. 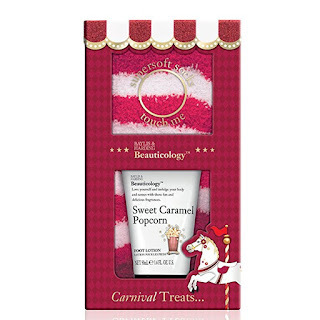 Packaging is striking in traditional red and white candy stripes with Carousel horses, dancing acrobat, big top tent, hot air balloon and Ferris wheel themes. Gift sets come in a range of different sizes from mini-manicure and pedicure sets to large bathing collections. Luxurious treats are fragranced in three deliciously mouth-watering fragrances, that capture all the fun of the fair; Candy Apple, Toffee Apple and Sweet Caramel Popcorn. Baylis & Harding's expert perfumers perfectly capture all the fun and fragrances of the fair with this festive Carnival Collection. Candy Apple, Toffee Apple and Sweet Caramel Popcorn smell as deliciously mouth-watering as they sound. Notes of fresh juicy apple are enhanced with sugary candy and warm buttery toffee whilst an infusion of caramel and popcorn creates an explosively fun fragrance. 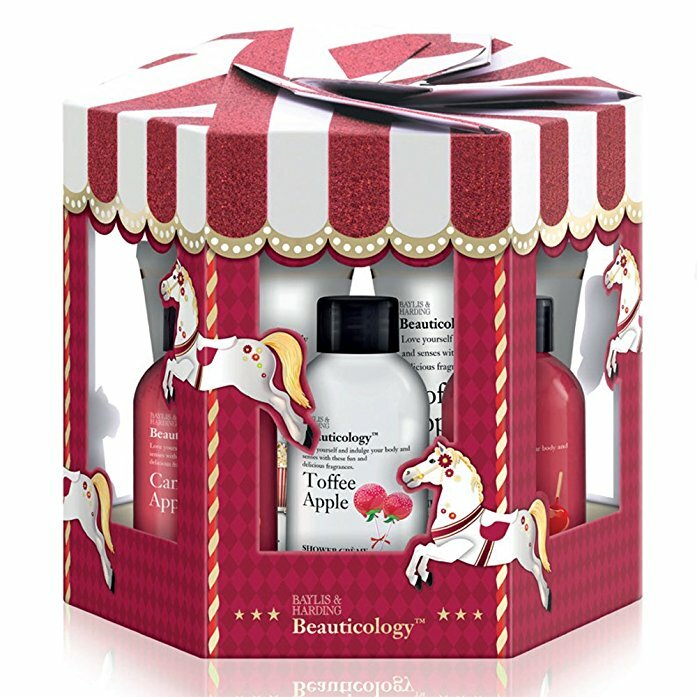 Baylis & Harding’s Beauticology Carnival Carousel Gift Box turns every Bathtime into Showtime with its stunning carousel gift box containing a collection gorgeous bathing luxuries. A 100ml Body Wash, 100ml Shower Crème, 50ml Body Lotion and 50ml Hand Cream have all been expertly infused in three deliciously mouth-watering fragrances that capture all the fun of the fair; Candy Apple, Toffee Apple and Sweet Caramel Popcorn. This is a perfect pampering present assured to be a hit this festive season. 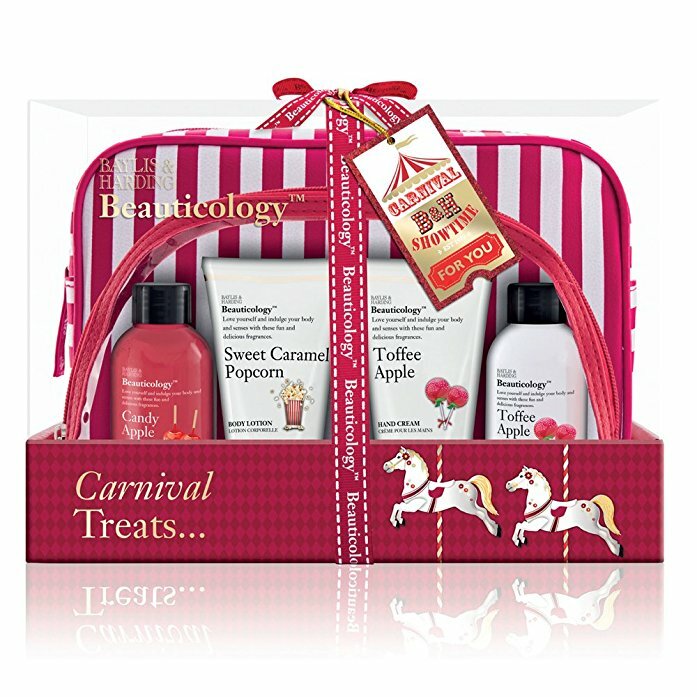 It’s Carnival Showtime as the curtain goes up on Baylis & Harding’s Beauticology Carnival Candy Stripe Luxury Gift Bag. This pair of red & white candy stripe Cosmetic and Toiletry bags will look stunning on any dressing table but bets of all they contain a selection of bathing treats. A 100ml Body Wash and 100ml Shower Crème gently cleanse skin whilst a 50ml Body Lotion and 50ml Hand Cream lock in moisture and leave skin smelling delicious and super soft. Baylis & Harding’s Beauticology Carnival Festive Feet Gift Set is a mini-pedicure set in fabulously festive ‘big top’ tent candy, red and white stripes and carousel horses. The 50ml Sweet Caramel Popcorn Foot Lotion is perfect for soothing and refreshing tired toes whilst a pair of Super Soft candy striped socks keeps feet cosy and warm. Baylis & Harding’s new Beauticology Carnival range captures all the fun of the fair and this set makes the perfect stocking filler or secret Santa gift. 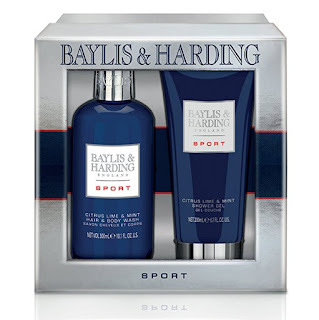 Baylis & Harding’s Men’s Sport is the perfect Collection for the active man. Whether for use after exercise or as part of his everyday grooming routine the refreshing blend of Citrus, Lime & Mint will appeal to men of all ages. Packaging focuses on denim with distressed detailing and red and silver metallic accents. The Collection looks modern, masculine and very much on trend this season. The energetic aromas of lime and bergamot make a perfect pairing when enhanced by the freshness of mint. Expertly blended with woody base notes they culminate in a truly refreshing fragrance that will revive and reinvigorate him, whether after sport or as part of his daily grooming routine. Baylis & Harding’s Citrus Lime & Mint Wash Bag Duo Set makes a great stocking filler or secret Santa gift. 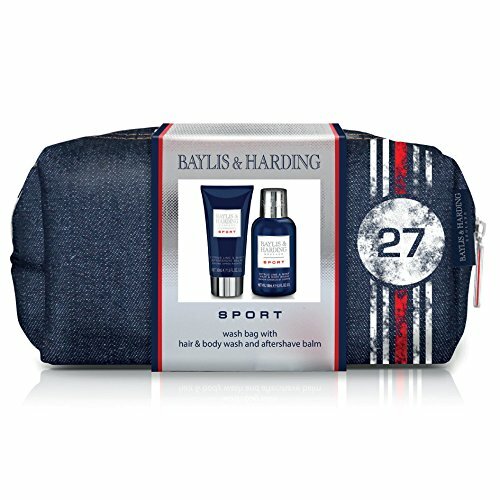 The stylish denim wash bag with distressed design detailing, contains a 100ml Hair & Body Wash to gently cleanse and keep him feeling fresh all day. The 50ml Aftershave Balm soothes and nourishes the skin. Both products are fragranced with Citrus, Lime and Mint, a truly refreshing fragrance of expertly blended woody base notes and energetic aromas of lime and bergamot. The perfect gift for the active man to keep in his sports bag. Baylis & Harding’s Citrus, Lime & Mint Grooming Duo Gift Set makes a great stocking filler or secret Santa gift. The stylish silver gift box with navy and red accents, reveals a 300ml Hair & Body Wash and 200ml Shower Gel to gently cleanse and keep him feeling fresh all day. Baylis & Harding’s Citrus Lime & Mint Grooming Gift Tin contains Baylis & Harding’s most popular grooming essentials. The stylish silver gift tin with navy and red accents not only looks good but can also be re-used as a practical man-tin. The 300ml Hair & Body Wash, 150g Soap and 130ml Shower Gel will keep him feeling fresh all day. A traditional face cloth and 130ml Aftershave Balm will ensure his face is super soft and kissable! 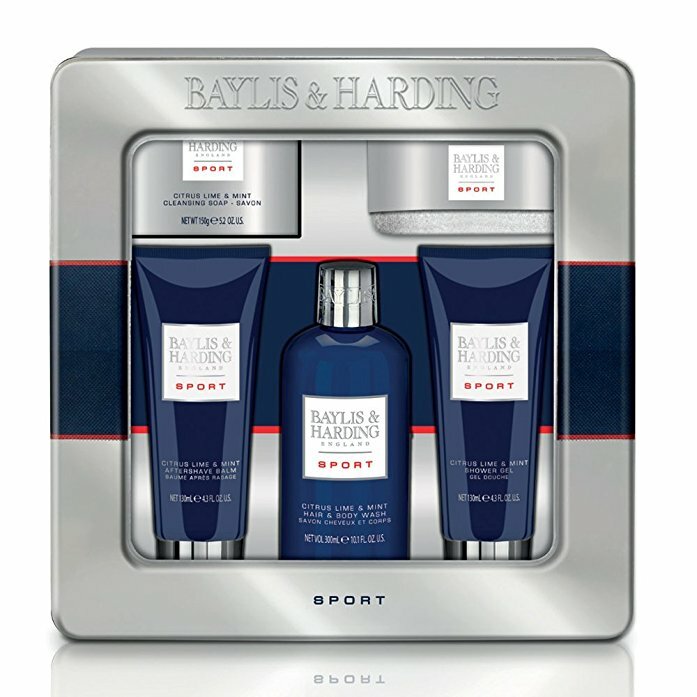 So if your still looking for that perfect gift or just want to add something to the pile for someone special then go and treat them to one the fabulous sets from Baylis and Harding. You can find Baylis and Harding gifts online at Amazon or online and instore at many high street stores/ supermarkets like Debenhams, Tesco, Asda, Sainsburys, House of Frazer.